What is education like in New Caledonia? Funny you should ask. We’ve all gone back to school this February and some of us have already attended the parent-teacher meetings. How very eye-opening! Many children start school at the age of 3, by going to preschool or “maternelle”. Here they’ll spend 3 years learning how to socialise, play, colour and in some cases, be exposed to a new or second language. At 6, they start primary school, and many will complete elementary and high school. School is mandatory from the age of 6. The majority of the schools are found in Nouméa, though some are found on the islands and in the north of the island. When students reach high-school age, they are typically sent to Nouméa to continue their studies. The school year follows the French system and has recently been changed to be 7 weeks of class, followed by 2 weeks of holiday, followed by 7 weeks of class, and so on through the school year (February-December). Despite a 4.5-day week (Mondays through Fridays, except Wednesday mornings) and long holidays and breaks, French (and thus New Caledonian) children spend more time at their desks per year than the average (847 hours a year, vs. 774 hours in OECD countries – and 971 hours a year for 12-14 year olds). 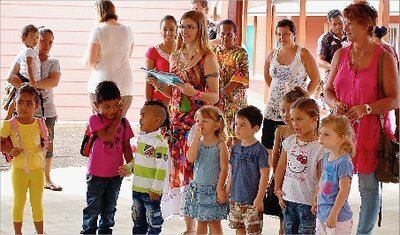 There are currently 5 public bilingual (English-French) schools in New Caledonia and 1 international school. Of the 5 bilingual schools, my understanding is that they are French with English sections. English is spoken approximately an hour a day (though this most likely varies from school to school). We’ve just learned that the James Cook International School is a French school that works to accommodate its (small) English-speaking student body (as communicated by the Directrice adjoint on 26 February at a teacher-parent meeting). At the end of lycée (or high school), the students pass the baccalauréat or bac, a tortuous week-long series of exams. Last year, 3,749 students took the bac and 2,782 passed it (an overall success rate of 74%). There is 1 university in Nouméa, but those who can send their children away for their tertiary studies. Approximately 3% of the Melanesian population go on to complete their university studies. Do they use corporal punishment? France (of which New Caledonia is still a dependent) is one of the only countries in the world where corporal punishment is legal. It is considered lawful in the home and is not explicitly banned in schools. This being said, corporal punishment, though not banned in schools, is considered unlawful and grounds for criminal punishment. I have heard of cases of corporal punishment in one of the Nouméa schools, but cannot speak for how widespread it is. I can tell you that yelling at and shaming children is a cultural norm (and one that I, as an anglophone, have a very hard time adjusting to and understanding). Do they have annual tests? Students pass 2 major exams during their time at school. One is the brevet, the first official diploma students have to take, at the age of 15. This exam covers material taught up to 5th grade and includes math, French, history/geography/citizenship. Students do not have to pass this test to enter high school. The second exam is the bac, as mentioned above. This is taken at the end of 12th grade and validates the child’s high-school education. If the student does not pass the bac, s/he can redo 12th grade and take the test again. What are the grades like? Students are graded on a scale of 1 to 20 on papers, tests and exams. The joke goes that 20 is for God, 19 is for the teacher, and if you are lucky, you’ll get an 18. For a good description of what grading is like in France (and thus in New Caledonia), in addition to a critical overview of the French education system, take a look at They Shoot School Kids, Don’t They? by Peter Gumbel. Are some groups favored over others in the educational system in New Caledonia? In theory, no. But discrimination happens the world over. I would not say that New Caledonia is any worse than anywhere else. I have to say that they strive to give every child access to free, quality education here, which makes us far more developed than other nations. Education in New Caledonia is a big topic, and I am not an expert on how the local schools work. I’d love to hear from you, should you be a teacher, parent or student. Tell me what you think of the system here – and if you have more questions about what it is like, pop your question in the comments. Not enough information on the topic exists in English, so anything and everything you have to say will build the knowledge we need to have. Reblogged this on Ontdek Melanesie. As in the French system, they finish school around the age of 18. Hoping this helps! Time off isn’t bad in itself, and I really think children need to balance academic work with other activities. It can be hard for parents to find quality care for their children every 7 weeks, however. What a neat blog, so concise and full of great info! Thank-you! I just love to share posts about the Pacific! So where are the primary schools located, and do u have contact details? Hi I am an Australian French teacher and would love to observe in a primary school in Nouveau. Is there a school you would suggest?